Supreme Court Justice Brett Kavanaugh was sworn in —again, for the cameras, this time — Monday night at a White House ceremony, but not before President Donald Trump slammed Kavanaugh's opponents for a "campaign of personal destruction." In a ceremony that could have been a unifying moment for the nation, Trump instead delivered remarks that even he acknowledged began "differently than perhaps any other event of such magnitude." "On behalf of our nation, I want to apologize to Brett and the entire Kavanaugh family for the terrible pain and suffering you have been forced to endure," Trump said, addressing the bitter partisan fight over Kavanaugh's nomination that became a firestorm after the emergence of sexual misconduct allegations, which Kavanaugh emphatically denied. With all the sitting justices in attendance, along with Kavanaugh's family and top admiration officials, Trump said Kavanaugh had been the victim of a "campaign of political and personal destruction based on lies and deception." But, he told the new justice, "You, sir, under historic scrutiny, were proven innocent." Critics have argued the investigation was not thorough enough to merit that conclusion. Kavanaugh officially became a member of the high court Saturday and has already been at work preparing for his first day on the bench Tuesday. In his own remarks, Kavanaugh, who has faced criticism that he appeared too politicized in his Senate testimony, tried to assure the American public that he would approach the job fairly. He said the high court "is not a partisan or political institution" and assured he took the job with "no bitterness." 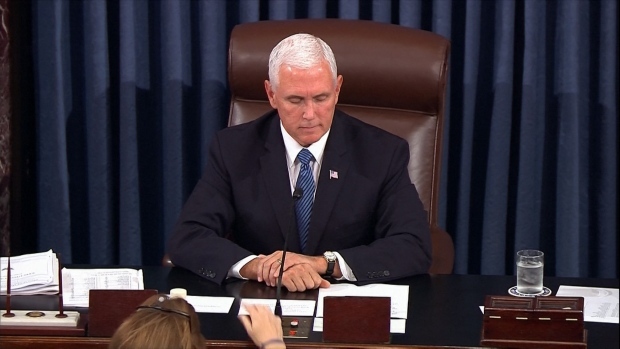 "The Senate confirmation process was contentious and emotional. That process is over. My focus now is to be the best justice I can be," he said. It was the end of a deeply contentious nomination process that sparked mass protests, an FBI investigation and a national reckoning over power, gender, sexual assault and the line between violence and adolescent transgression. And it comes less than a month before pivotal midterm elections that will determine which party controls Congress. Ceremonial swearing-ins are unusual for new justices. Only Samuel Alito and Stephen Breyer participated in White House events after they had been sworn in and begun work as justices, according to the court's records on the current crop of justices. Kavanaugh and his law clerks already have been at the Supreme Court preparing for his first day on the bench Tuesday, when the justices will hear arguments in two cases about longer prison terms for repeat offenders. The new justice's four clerks all are women, the first time that has happened. 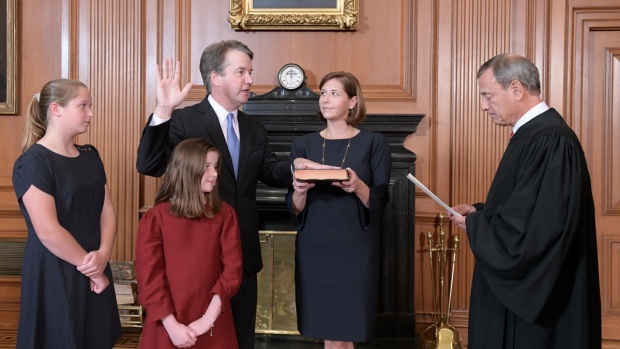 The clerks are Kim Jackson, who previously worked for Kavanaugh on the federal appeals court in Washington, Shannon Grammel, Megan Lacy and Sara Nommensen. The latter three all worked for other Republican-nominated judges. Lacy had been working at the White House in support of Kavanaugh's nomination. In his Senate testimony last month, in which he denied allegations that he sexually assaulted a woman in high school and accused Democrats of orchestrating a partisan campaign against him, Kavanaugh promised: "I'll be the first justice in the history of the Supreme Court to have a group of all-women law clerks. That is who I am." Trump's ceremony speech hammered a theme he has been hitting on all week: hoping to energize Republicans by attacking Democrats for opposing Kavanaugh. 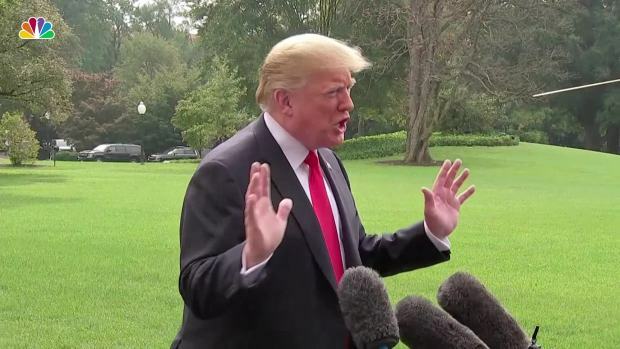 Kavanaugh was "caught up in a hoax that was set up by the Democrats," Trump said as he left the White House earlier in the day for a trip to Florida. "It was all made up, it was fabricated and it's a disgrace," he said. Later, in Orlando, he called Kavanaugh "a flawless person" and said "evil" people had tried to derail him with "False charges" and "False accusations. Horrible statements that were totally untrue that he knew nothing about." "It was a disgraceful situation brought about by people that are evil. And he toughed it out," Trump said at the International Association of Chiefs of Police meeting. The accusations transformed the clash from a routine struggle over judicial ideology into an angry jumble of questions about victims' rights and personal attacks on nominees. President Donald Trump announced there will be a ceremony Monday to formally swear in Brett Kavanaugh to the Supreme Court. Accusations from several women remain under scrutiny, and House Democrats have pledged further investigation if they win the majority in November. Outside groups are culling an unusually long paper trail from his previous government and political work, with the National Archives and Records Administration expected to release a cache of millions of documents this month. Senate Majority Leader Mitch McConnell, who was welcomed at the White House with a standing ovation, on Sunday praised his party's senators, whom he said re-established the "presumption of innocence" in confirmation hearings. "We stood up to the mob," he said. McConnell signaled he's willing to take up another high court nomination in the 2020 presidential election season should another vacancy arise. He tried to distinguish between President Donald Trump's nomination of Kavanaugh this year and his own decision not to have the GOP-run Senate consider President Barack Obama's high court nominee, Merrick Garland, in 2016. McConnell called the current partisan divide a "low point," but he blamed Democrats. Two years ago, McConnell blocked a vote on Garland, citing what he said was a tradition of not filling vacancies in a presidential election year. But when asked again Sunday about it, he said different rules might apply if the same party controls the Senate and White House. Republicans hold a 51-49 majority in the Senate, with several seats up for grabs in November.